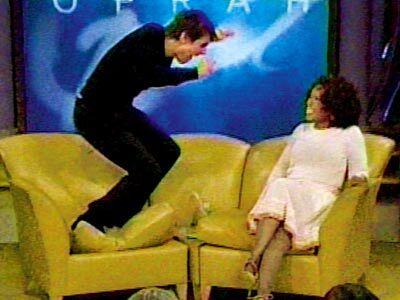 There's no doubt that Tom Cruise is a looney off the deep end of the pool -- he showed us that on Oprah. But this new video is unbelievable. Can someone please clue me in on what the crap he's talking about? The original video appeared first on YouTube and then a couple other sites earlier today before CoS's lawyers sent cease-and-desist letters. Gawker then decided to run the story and post the video. My favorite thing about the article is the last line, which states, "Gawker is now hosting a copy of the video; it's newsworthy; and we will not be removing it." I just love that. They know what their actions mean and yet they invite the battle anyway. Of course, not long after that post, they (Gawker) received a letter from the lawdogs in L.A. Gawker stood true to their word and prepared a statement saying they were not in violation of copyright laws, they were not participating in any criminal activity, and the video was going to stay up. The legal letters are found here. This should be one of the first big lawsuits of 2008 and I'm excited to see how it all unfolds. Hoorah for America being the most litigious country in the world! P.S. Dane Cook make fun of Tom's visit on Oprah here and it is hilarious.